How can you VOTE for EOS9CAT? EOS Block Producer Community has built many tools for voting. EOS9CAT, the Block Producer Candidate, is happy to compile the most up to date list of these tools and hope this article helps you make the informed decision on what is the most suitable tool for you to cast the vote. It is not a stand-alone software and it is an only browser extension. You need to input the private key of the registered EOS account to be able to vote on EOS Portal. For non-programmers who own a small number of tokens, this is probably the easiest way to stake their token and vote for block producers. However, you will have to import your private key while you are online, so it is critical to making sure your computer is free of the virus. In order to download the extension to Chrome, please click here. This a desktop application for Windows, Mac, and Linux. It is both a wallet and a voter. If you set up your account with a password, the software will encrypt your private key for the future use, otherwise, your private key will not be saved. EOS Voter is a limited-functionality release of a light wallet being designed for the EOS Blockchain. This application can be used to connect to a remote EOS API endpoint to perform producer voting actions and a few basic wallet commands. A detailed instruction for installing and voting is here. This is method is slightly harder than using Scatter, since it requires some technical understanding of the fundamental Blockchain Technology, and also requires to switch the device on and offline. It is the similar concept of using Scatter except it signs the transaction offline, which greatly reduced the risk of your private key being hacked. This method is good for people who have large holding to vote since you will never expose your private key to the internet which greatly reduced the risk of losing your private key. A more detailed information is available here. EOSC is a cross-platform (Windows, Mac, and Linux) command-line tool for interacting with an EOS.IO blockchain. It contains tools for voting and a Vault to securely store private keys. It is based on the eos-go library, used in eos-bios, the tool used to launch the EOS mainnet. This first release holds simple tools, but a whole cleos-like swiss-knife is being developed and will be released shortly after mainnet launch. Source code for most operations is already available in this repository. EOS9CATonly recommends EOSC to the advanced users who have experience with command line interface. This is part of the functionality of the EOS.IO software provided by Block.one. Since it is also a command line interface tool. This approach is only recommended if you are an advanced blockchain programmer. Here is the detailed instruction on how to vote using Cleso. 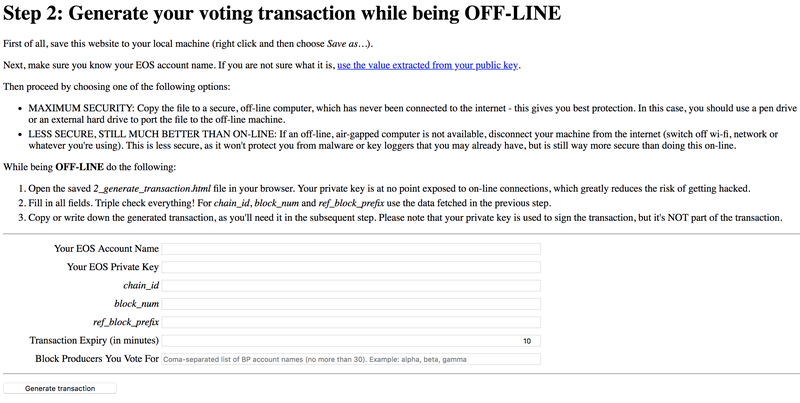 In conclusion, if you are holding a small amount of token, as long as make sure your computer is free of virus, the chance of your private key being hacked is slim when you are using one of those online voting tools: Scatter, EOS Voter. If you have a large holding, the offline tool is safer to use because it reduces the risk of exposing your private key to the internet. FOLLOW US on Facebook, Telegram, Medium, SteemIt, Github, Meetup E0S9CAT, Reddit, and Twitter.